Sprial Hams - $2.99 lb. Save $1 lb. Beef Ribeye Steaks - $8.99 lb. Save $3 lb. Boneless Leg Of Lamb - $5.99 lb. Save $4 lb. Filet Mignon - $7.99 lb. Save $1 lb. Hickory Smoked Spiral Hams - $4.99 lb. Kielbasa - $3.99 lb. Save $2 lb. Stew's Regular or Thick Cut - 1 lb. pkg. Short Ribs - $3.99 lb. Save $3 lb. Whole First Cut Beef Brisket - $5.99 lb. Save $3 lb. 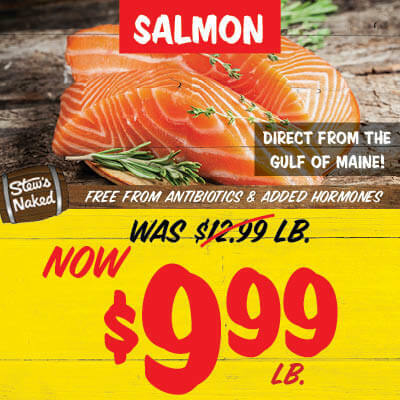 Fresh Norwegian Salmon Fillets - $9.99 lb. Save $7 lb. Jumbo Shrimp - $9.99 lb. 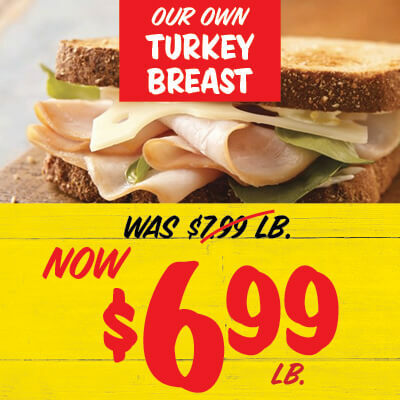 Save $7 lb. Large Shrimp - $7.99 lb. 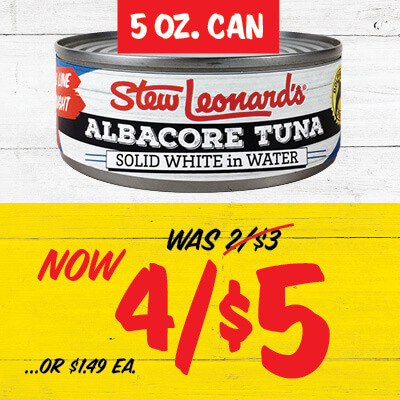 Save $4 lb. Ripe Sweet - 6 oz. Broccoli Rabe - $2.49 lb. 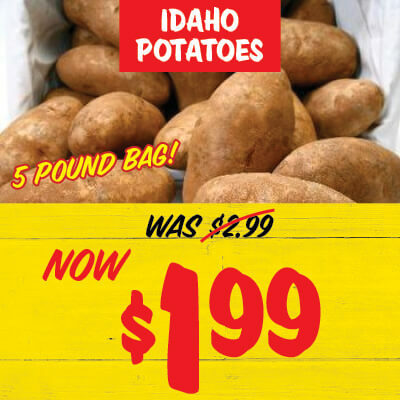 Save $1.50 lb. Green Beans - $1.49lb. Save $1 lb. Red Seedless Grapes - $1.99 lb. Save $1 lb. Red, Yellow or Orange Peppers - $1.99 lb. Save $1 lb. Our Award Winning – Dairy Fresh Sweet Cream - 1 lb. pkg. Assorted Flavors - 5.3 oz. Direct From Italy - Tastes Like Parmigiano Reggiano at More Than 50% Off! Grana Padano Cheese - $7.99 lb. 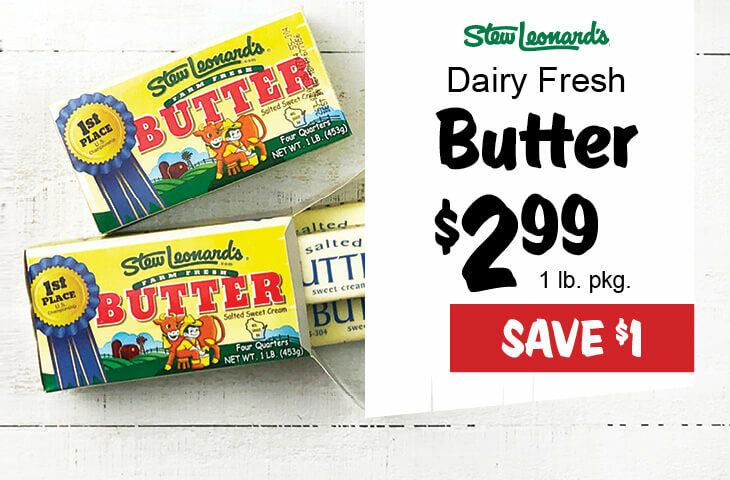 Save $2 lb. Brie Cheese - $8.99 lb. Save $2 lb. Mozzarella - $6.99 lb. Save $1 lb. Provolone Cheese - $7.99 lb. 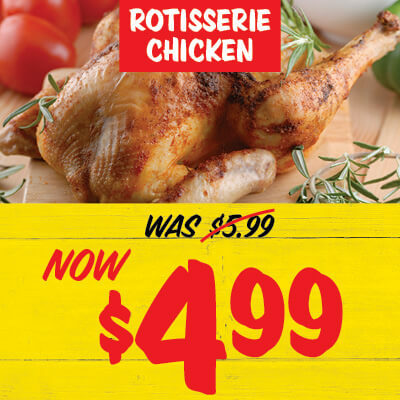 Save $5 lb. Jumbo Jar - 32 oz. Jumbo Hydrangeas - $19.99 ea. 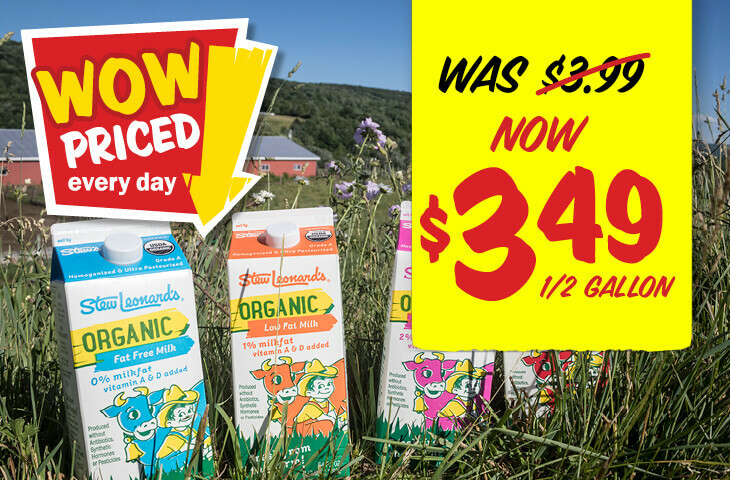 Organic Milk - $3.49 ea. 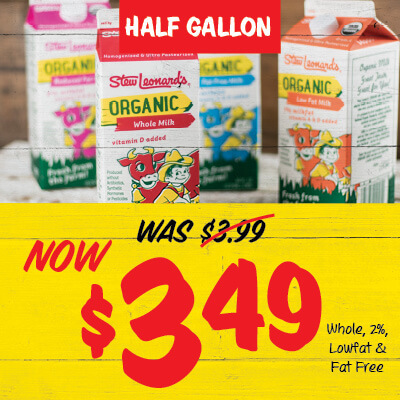 Stew Leonard's - Solid White - 5 oz. 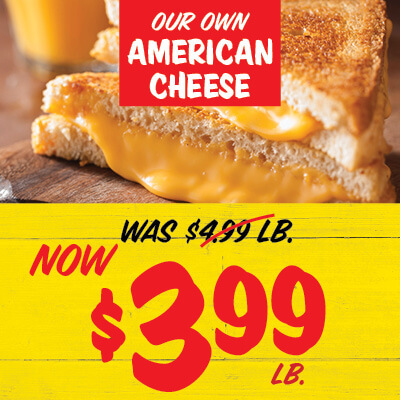 American Cheese - $3.99 lb. 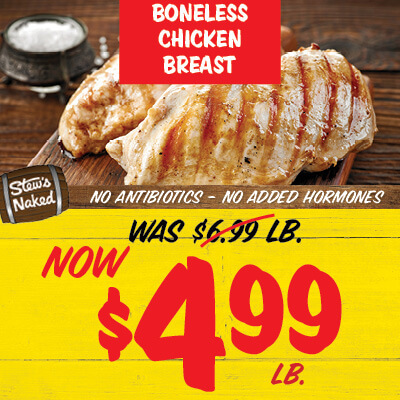 Boneless Chicken Breasts - $4.99 lb. Assorted Varieties - 5.3 oz. 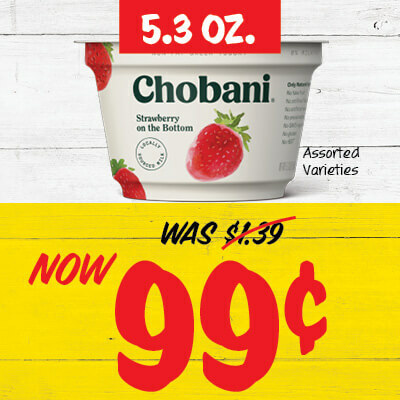 Chobani Greek Yogurt - $0.99 ea. Stew Leonard's - 10 oz. 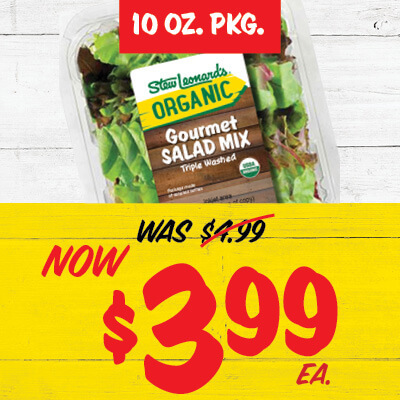 Organic Gourmet Salad Mix - $3.99 ea. 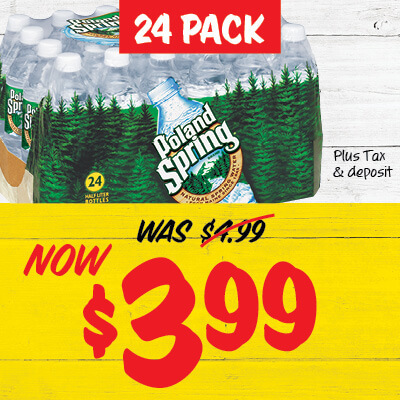 Poland Spring Water - $3.99 ea. Salmon Fillet - $9.99 lb. Prices effective Monday through Thursday every week.